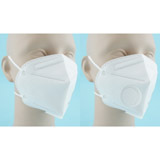 Respirators - Pan Taiwan Enterprise Co,. Ltd.
are approved for use against solid and liquid aerosols according to EN149: 2001. They are suitable for protection against non-toxic harmful materials in concerntrations up to 4 x OEL or 4 x APF. are approved for use against solid and liquid aerosols according to EN149: 2001. They are suitable for protection against low-to-average toxicity harmful materials in concernstraptions up to 12 x OEL or 10 x APF. are approved for use against solid and liquid aerosols according to EN149: 2001. They are suitable for protection against high toxicity harmful materials in concernstraptions up to 50 x OEL or 20 x APF. N95 disposable particulate respirators are approved with filtration 95% effective against particulate aerosols free of oils. 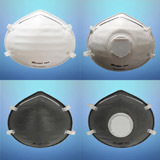 Conforms to NIOSH 42 CFR Part 84 standard as N95 class. Dolomite clogging test is an optional test under morms EN149:2001. 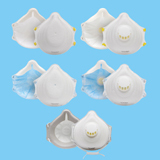 Those respirators which pass the dolomite clogging test are proved a more comfortable breathing while wearing the respirators and will be marked as symbol"D"after the class of respirators such as FFPID. 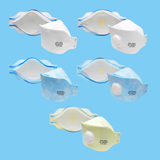 The Dolomite test is to expose the respirator under a concentration of dolomite dust at 400_+100 mg/m3 with dust size ranging from 0.7~12 m with a simulated breathing at 2 liter/stroke. Continue the test until measured dust concentration and exposure time 833 mg.
h/m3 or until the peak resistance reaches the specified limit. Then measure the breathing resistance and the filter penetration. 1. Metal Free -- no metal nosepiece or staple. 2. Adjustable Headstrap -- with competitive price, the customers can enjoy the convenience of adjustable headstrap. 3. Pre-Shape Nose Cushion -- no metal nosepiece required. 4. Intimate Touch -- soft Polypropylene inner lining. 5. Latex-Free Cloth Headstrap -- knitted cloth headstrap can eliminates the adhesion of rubber headstrap against the face when there is perspiration.